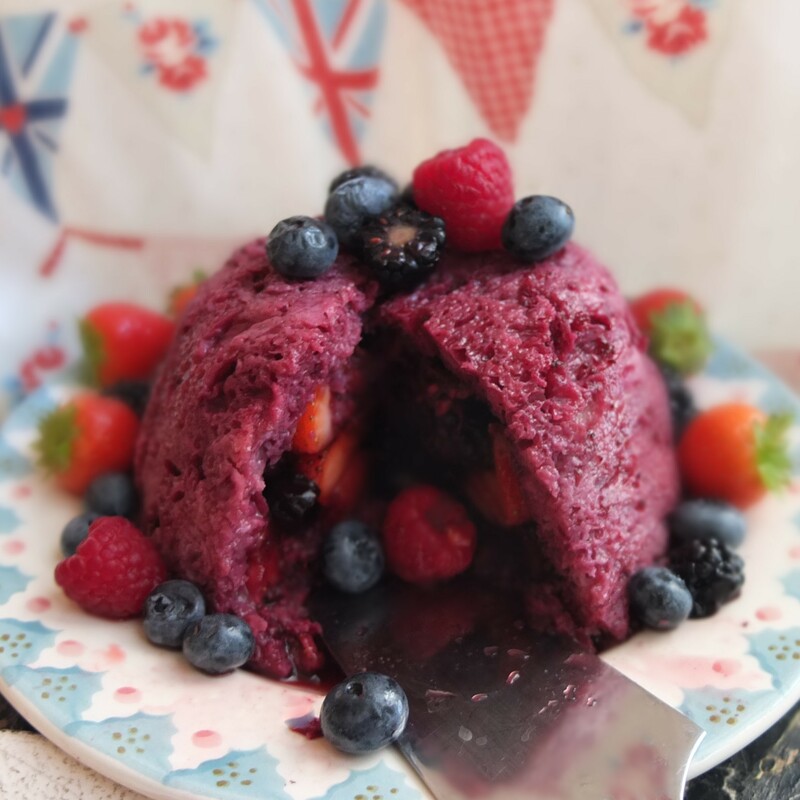 This summer pudding’s adapted from various online recipes. The main one’s on the delicious magazine website, based on Richard Bertinet’s recipe which involves both sourdough bread and cassis liqueur. You can use standard gluten-free bread or brioche too. I made mine smaller and lined the bowl with plastic film just to be safe but it’s possible to avoid using plastic by lightly oiling the bowl instead. Next time I’ll be brave and try that. Mine’s also a little healthier sweetened with maple syrup instead of sugar. 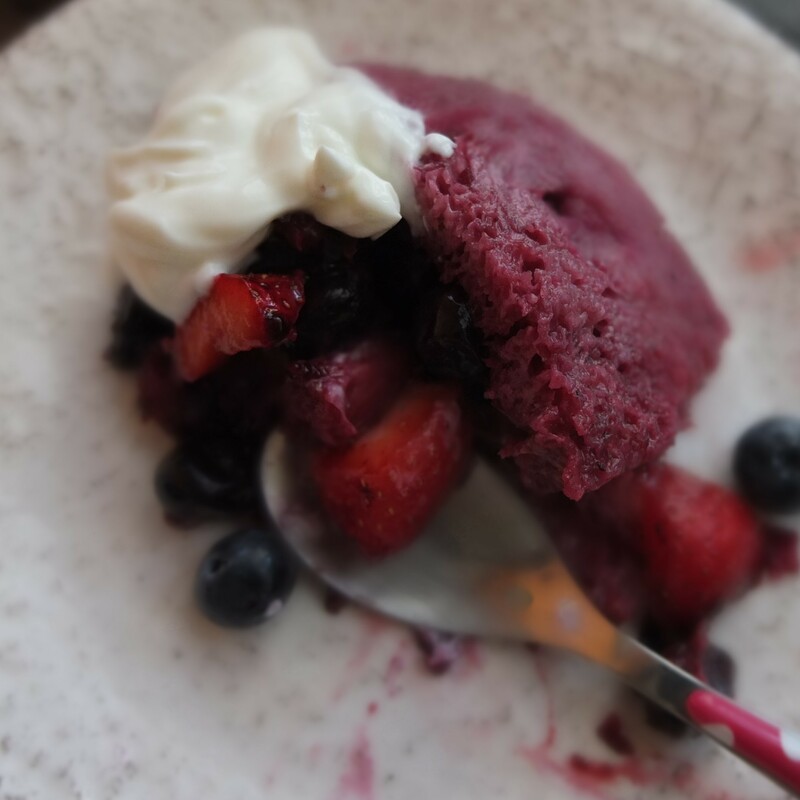 It was delicious with some skyr (Wikipedia article here) and if you’re a non-vegan maybe check it out because it’s like a cross between yoghurt and cream – delicious, low calorie and slightly tangy with a great thicker consistency! Apparently modeIs eat it. Lol. Just discovered it last week at Lidl’s here in Barcelona. 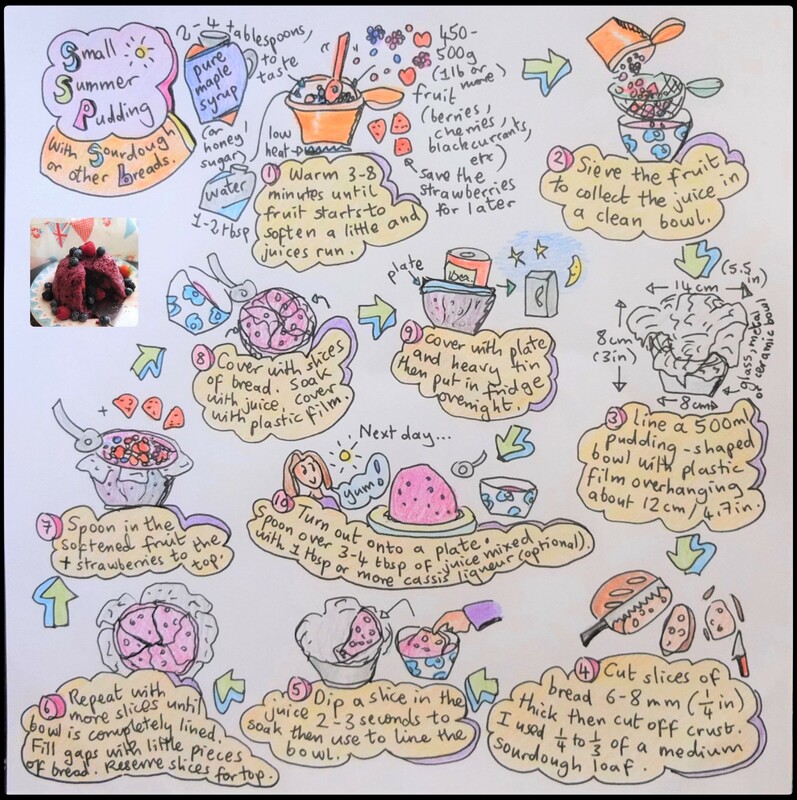 Approximate quantities are given for a small 500ml sized bowl and a pudding that isn’t too sweet but they’re flexible depending on your bread and kinds of fruit. Use any sized bowl you like and adapt. I’d suggest heating more fruit rather than less because you can always reserve some to serve with the pudding. If you do find there isn’t enough to fill the bowl warm up more fruit. 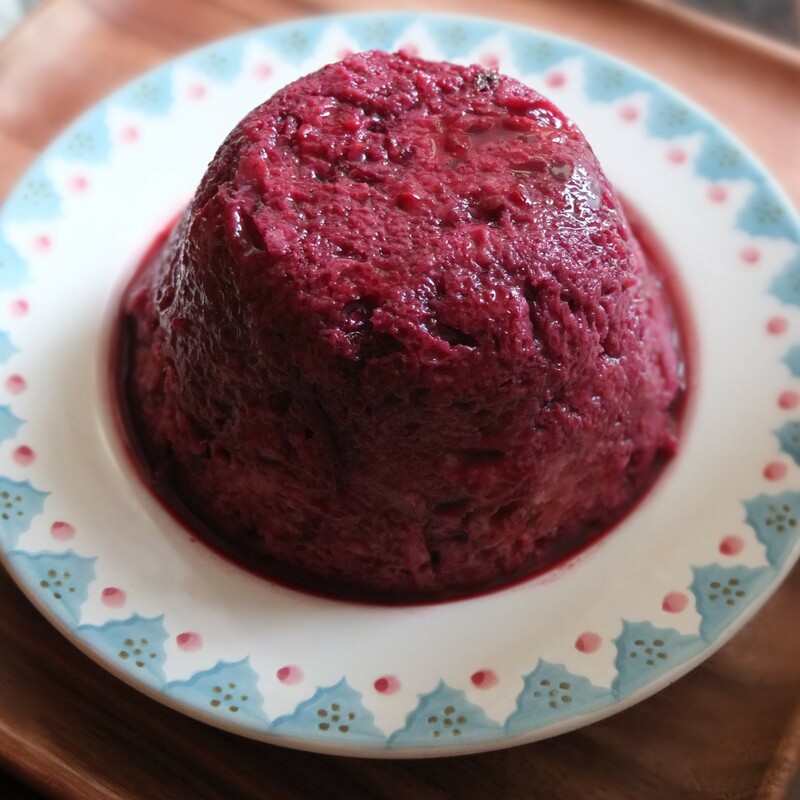 A pudding-shaped bowl (contains 500ml or 500g water) – mine was 14cm diametre at the top, 8cm high and 8cm diametre at the base. Make the day before so it can chill in the fridge overnight before turning it out. It takes about 30 minutes to make. The bread: use any kind. Sourdough bread is exciting because it’s so flavoursome and digestible. It also holds well and the slices have a kind of triangular shape so fit nicely together – you just need to plug the holes a bit. 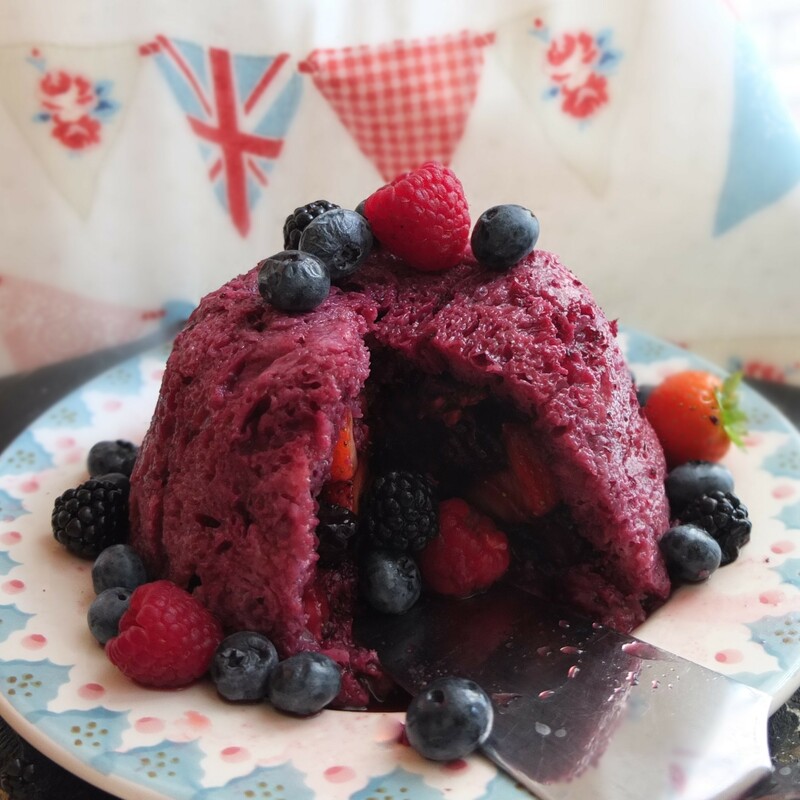 My only concern is you cut away the crust which is a really tasty part but if you have lots or it’s going stale then it’s worth using because summer puddings are absolutely delish! Otherwise please feel free to use other bread and if it’s soft let it go a bit stale before. You almost don’t need to weigh anything and could do it by eye. The measurements below are approximate to give you a general idea. 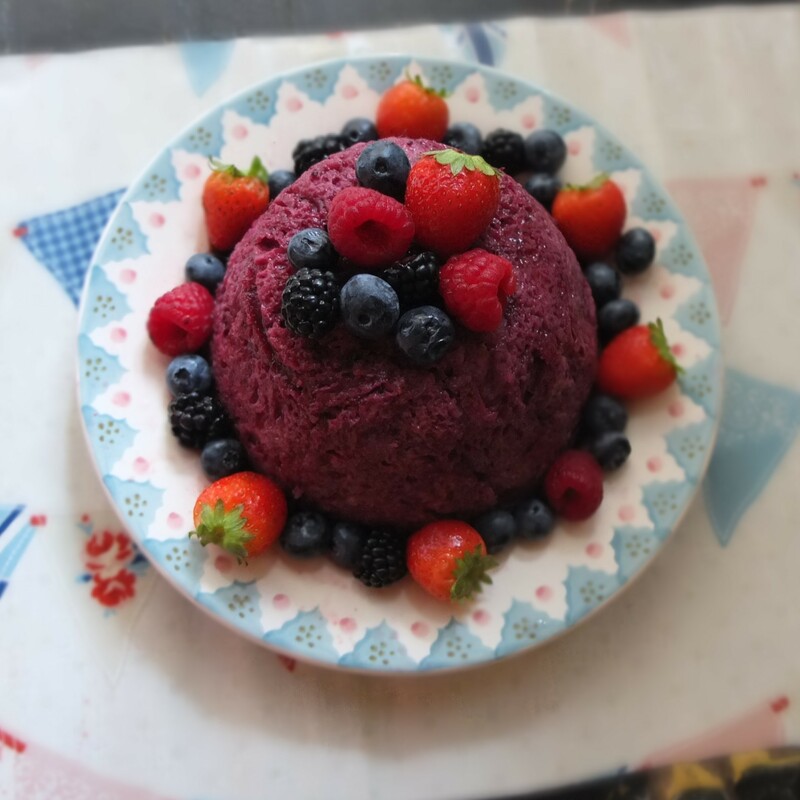 450-500g (about 1lb or more) mixed fresh or frozen fruits like berries and currants: blackcurrants, raspberries, cherries, raspberries, blackberries, redcurrants and strawberries (separated). Note: the strawberries don’t get heated up – leave separate and add in when filling the bowl later. 1/4 to 1/3 of a medium sourdough loaf (depends on the height and shape of your loaf) – the armount of bread I used weighed around 250g with crust. 1-2 tbsp cassis (blackcurrant liqueur), optional (could be replaced with blackcurrant juice or omitted) mixed with 3 tablespoons or so reserved fruit juice. Follow the instructions in the illustration going in a spiral from left to right. Note: if your bread is quite soft maybe don’t soak it before lining the bowl – the pre-soak is optional. It it’s a small pudding the slices should be quite thin (6mm) but for a big pudding you could have thicker slices. …but the second got decked out with fruit. Whatever you prefer – they’re both delicious! 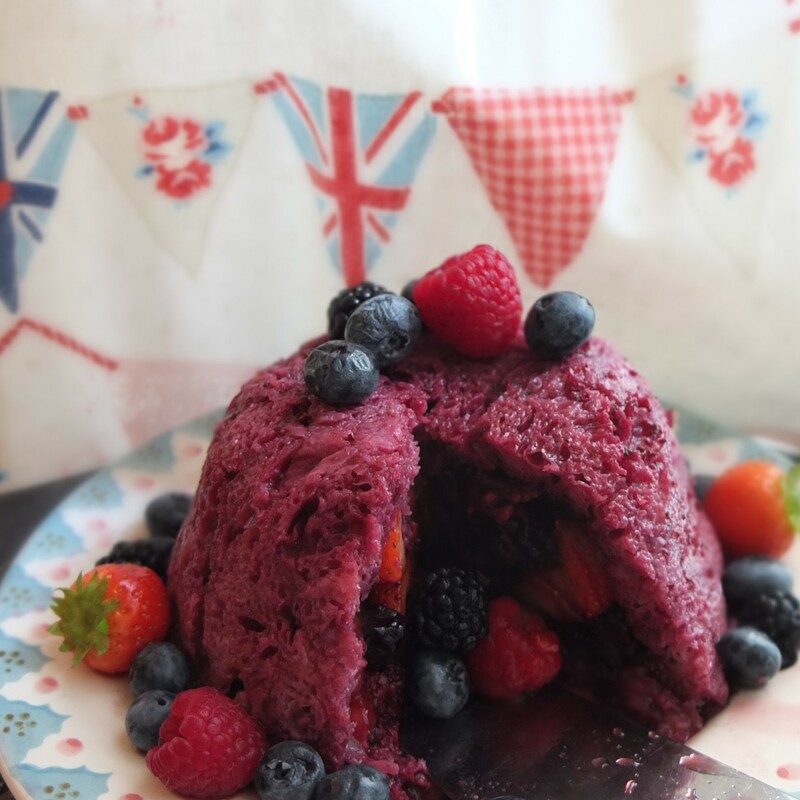 So let’s have some very yummy taste-explosiony healthier sourdough summer pudding! This pudding brought back memories! 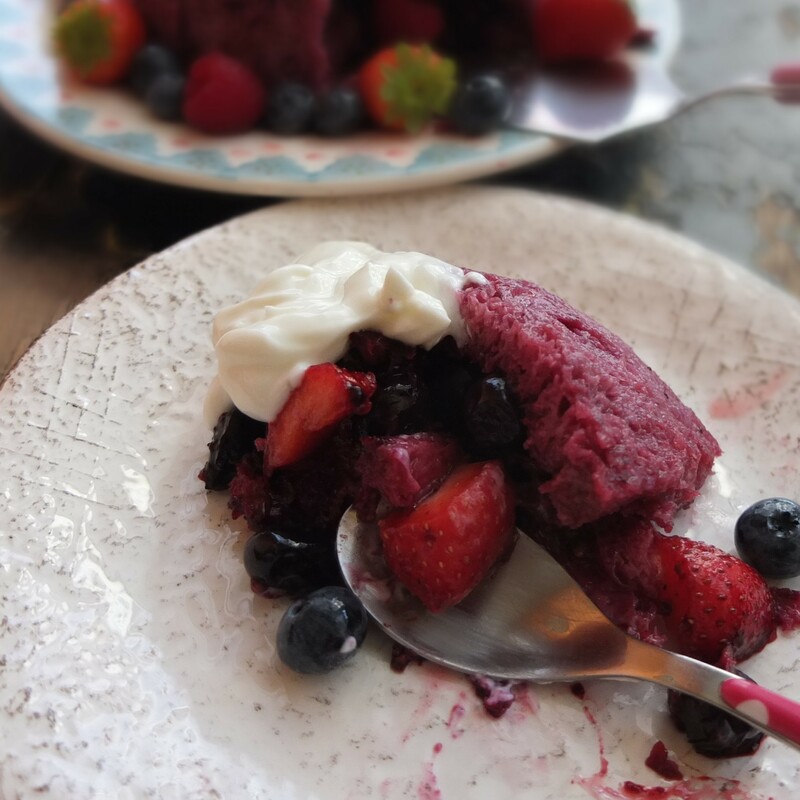 Love your pudding with the gorgeous color! The colors are wonderful! It looks delicious! Mmmm, mmmm, Lili. Can’t wait for the summer fruit to roll around. I haven’t been by for awhile! I’m so glad I stopped by and saw this! Puddings like this aren’t very well known in the states, but I think it’s time to change that! !